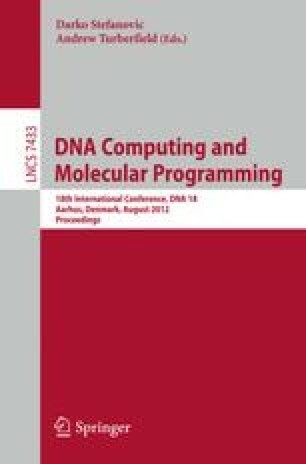 In this paper we report on a module in the RTRACS molecular computing system, constructed with DNA, RNA and enzymes. The module is a 2-input logic gate that receives input and produces output in the form of RNA molecules. Each of the two input molecules is chosen from a set of two, and the logic gate produces an output molecule for each of the four possible input combinations. Two output RNA molecules can be produced by this module, one for only one combination of inputs, whilst the remaining three combinations lead to the production of the other output. Since the RNA strands can be arbitrarily assigned logical values, this module is capable performing multiple logical operations, including AND, NAND, OR and NOR, given the appropriate mapping of RNA molecules to logical values. We performed numerical simulations of the logic gate reaction scheme, revealing the details of the kinetics of the production of output molecules and the theoretical input-output characteristics. We also experimentally demonstrated the proper functioning of the logic gate, showing the correct formation of intermediate steps, the real time production of output molecules as well as the input-output characteristics of the module. We believe this versatile logic gate has significant advantages as a basic module of RTRACS due to the wide variety of possible logical operations.